Retailers Carpetright and Debenhams have become the latest to fall victim to the tough consumer environment as earnings and sales struggled. 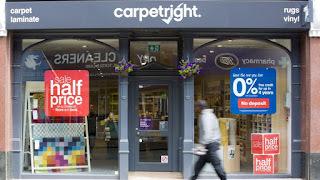 Carpetright reported a 93% fall in pre-tax profits to £900,000 for the year to 29 April, largely because of a one-off charge related to its loss-making stores. But its earnings were also hit by the plunge in the pound - which has pushed up the cost of imports - coupled with the need to keep prices down amid tough competition. Like-for-like UK sales were down 0.5% over the year after a tough first half, though there was a "significant improvement in performance" in the second half. Carpetright chief executive Wilf Walsh said the group faced "a challenging consumer environment and competitive landscape" but was confident it could grow market share. The group said it had made an encouraging start to the new financial year "despite continued economic uncertainty", with sales up 2% in the seven weeks to 17 June. That helped lift the shares, which were up 8% in mid-afternoon trading. Meanwhile, Debenhams said like-for-like sales were down 0.9% in the 15 weeks to 17 June as the UK trading environment "has been more volatile in the second half of our trading year". The department store chain said it expected pre-tax profits for the full year to meet expectations, but added that "should current market volatility continue" it would be at the lower end of the range. Chief executive Sergio Bucher said: "May was a tough month for retailers and we continue to see volatility in trading week to week." The retail updates came as new figures showed consumer confidence - already buffeted by rising inflation - falling sharply in the wake of the indecisive General Election result.